The Dresden Stollen knife was already being used by August the Strong in 1730, when he cut up the legendary fruit loaf of enormous size. It weighed 1.8 tons and was transported to the Zeitheiner Lustlager celebration on a wagon drawn by eight horses. To make the Stollen, the master baker Andreas Zacharias built a special oven, which had to be heated up for eight days beforehand. The Stollen was then cut and divided up with a knife 1.6 m in length specially made for this occasion. The Dresden Stollen knife, which was kept in the Royal Silver Vault of Dresden Castle for 200 years, allows fruit loaf to be sliced cleanly. You only have to slide the blade through the Stollen with a seesawing action to cut a perfect slice. 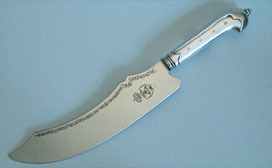 You can then pick it up with the Stollen Knife and serve without any crumbs at all. 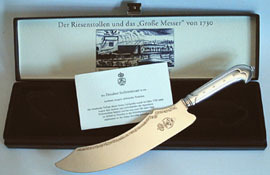 A faithful reproduction of the famous Dresden Stollen knife is not just a delightful and valuable Christmas present designed to please everyone, but something which is truly practical at the same time.